When markets go up and most stocks show strength, the strategy is obvious: pick some broad asset-class, and ride the trend. Likewise, when most stocks are very weak (markets are narrow), shorting the weakest part of the markets until the narrow leadership gives-up is often, the way to go. And what if there's so much uncertainty, and markets seem to be schizophrenic? Is there anyway we can reposition our portfolio so it gains regardless of the direction of the market? Market schizophrenia is exactly what we have right now. On June 5, 2008 U.S. markets had their biggest gains in the past month after after retailers (notably Wal-Mart) posted stronger-than-expected May sales and data showed a surprise fall in weekly jobless claims, fueling optimism about the health of the economy. Just a day later, on June 6, 2008 the Dow fell 394.64 points after the May unemployment rate jumped by 0.5% to 5.5%: the biggest jump in 22 years. To add fuel to the fire, oil prices shot to another record, renewing fears that the U.S. economy may be facing a 1970s-style stagflation. What maybe hard to understand is the constant flow of seemingly contradictory data: jobless claims are down, but unemployemnt is up, crude oil is up yet, oil stocks are down. In fact, things are not so contradictory, different data points refer to different past periods. Some indicators may be leading, other lagging. Stocks often go up on expectations and rumors, then sell-off when the actual news come out, etc. In any case, when uncertainty goes up, investor nervousness and anxiety go up too, and the markets become more volatile and unpredictable. Twice in the past year I hinted towards market neutral strategies. Strategies that have the potential of working regardless of market direction. The first time was when I wrote about Harry Markowitz and portfolio optimization. How to construct a portfolio of assets that are relatively uncorrelated with each other. The second time was last November when I proposed a long/short bear market portfolio which proved extremely resilient to the recent market meltdown. I think it is now time to use a combination of both strategies with a twist. Instead of combining two uncorrelated assets, I'm planning to enter a particular pair-trade where assets are highly correlated, but one will be a short, and the other a long. The reason why I think this trade will work is that the long asset has been showing a clear relative strength advantage vs. the short asset, in both up and down periods since March. This pair trade should benefit even more from volatility, so it is leveraged too. Lastly, as usual, I would target broad asset classes. I've been wrong too often when betting on single stocks, so no stock picking or narrow bets would be involved. Single stocks are just too unpredictable for my taste. Figuring out what is predictable, is, IMHO, more important than any other decision in investing. Let's look at the assets. Mid cap stocks have been extremely resilient recently, while large-cap value stocks have been failing repeatedly in their attempt to make a bottom so far this year. Note that this is not a particular bet on financials going down further, since the bet is on a wider asset class. Accordingly, I feel it is a safer bet to make than being short a single weak sector like financials. In most cases, what I would expect to see is symmetry: the asset that went up the most in an up-leg, usually goes down the most in the down-leg. The reason is that the differential in strength, comes mostly from beta (volatility). During long bull markets, high beta is your best friend: just ignore the strong dips, and enjoy the even bigger up-legs. But now we are in the twilight zone. It may be a beginning of a bull, a continuation of the bear, or even a long sideways period of ups and downs in the market like most of 2004 was. Yet, what we do see here, is an inherent strength of mid-cap stocks which seem to shine vs. the weaker large cap stocks and especially the "value" ones. The reason is that we are in a clear de-leveraging environment where credit is tight and investors assign premium to companies that are financially stable, growing earnings, have strong balance-sheets, and excess cash, while punishing companies that rely on cheap credit/debt to survive. The "value" stocks seem to be a "value trap". In this environment, they just keep-on losing. For example, on Friday, June 6, a quintessental panic day, US mid-caps (MDY) fell sharply (-2.86%), but large-cap value stocks (IWD) fell even more (-3.18%). IOW: our trade would not only have avoided the huge 3% market drop, it would actually have gone up slightly, about 0.25%, last Friday thanks to the relative strength differential and the volatility leverage. Eventually, this relative strength of mid-cap stocks should reverse, but for the next 1-3 months, I feel this is a pretty low-risk bet to make: be long US mid-cap, while shorting US large-cap value. 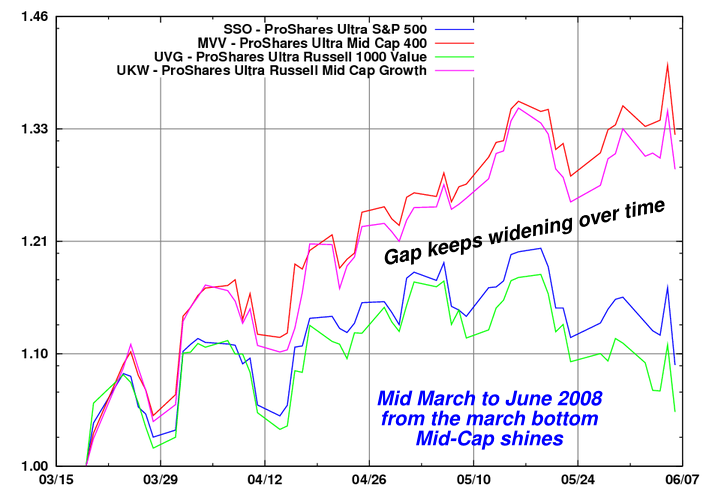 On the short-side: you may buy the ultra-short large cap value ETF (SJF) instead of selling (shorting) UVG. The two should behave more or less the same. One more note, since this trade involves two leveraged ETFs, I always try to benefit from short-term volatility. I would sell the short when markets have a short-term spike, and buy the long when markets have a short term dip. Since markets are so volatile I would wait till monday to see where markets are moving, if markets fall, I would start by establishing the long half first, then wait for a reversal to enter the short half position (act contrarian). Conversely, if markets are up on monday, I would enter the short half first, to benefit from the spike (sell high), then wait for some consolidation to enter the long half (buy low). Note that both SJF and UVG have very bad liquidity compared to MVV, be careful and use limits when entering this trade, especially on the low-liquidity side. There are many other ways to play this idea. e.g. those who are looking for less leverage and lower costs may use a non-leveraged alternative. long: VXF (Vanguard Extended Market) or MDY (Mid-cap, unleveraged), and short: SPY (S&P500) or IWD (Russell 1000 large-cap value) or VTV (Vanguard value VIPERs). To set expectations straight, this trade will not work every day. 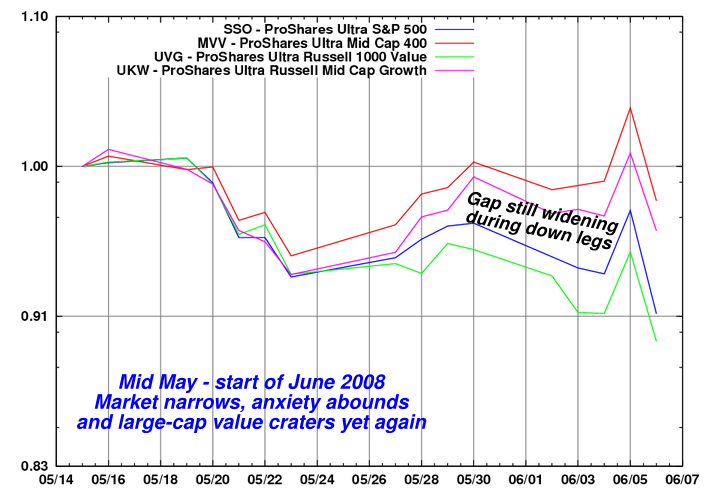 In some days large cap value may lose less, or gain more than mid-cap. But as long as this pair is doing better than the market, on a roughly bi-weekly basis, it would be doing what I expect it to. If a full month passes and things don't work out as expected, I would reconsider the whole thesis. Even if this trade does not work as expected, I believe this pair-trade should lose less than the broad market, assuming the markets revisit their March lows. In other words, this is a market neutral trade, with some downside protection. In addition, I feel it has a higher upside potential than sitting on cash in times of increasing uncertainly, rising inflation, and schizophrenia. As always, any feedback, question, request, criticism, is welcome.